Maureen Callanan is helping plan a new exhibit at Children's Discovery Museum. Thousands of years after roaming the riverbeds of what is now downtown San Jose, a juvenile mammoth will get new life inspiring a generation of young visitors to Children's Discovery Museum of San Jose. As the museum develops an exhibit around the remains of the mammoth, UC Santa Cruz psychology professor Maureen Callanan is gearing up for a major research project that will explore the ways children learn to use evidence and figure out answers to questions in everyday life. In other words, how they learn to "think like scientists," said Callanan. As a developmental psychologist, Callanan will also investigate how parents guide children in their everyday explorations, sometimes without even thinking about the support they're giving their youngsters. "We're interested in how parents' ways of thinking are related to their experiences with science, and how they communicate these ways of thinking to their children," said Callanan. 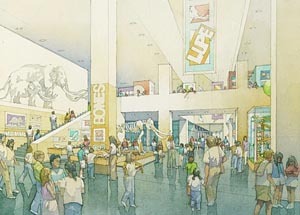 The project is a collaboration among Children's Discovery Museum, UCSC, and the Museum of Paleontology at UC Berkeley, with funding from the National Science Foundation. Callanan and a team of graduate students that includes Megan Luce, a doctoral candidate in psychology, will research the educational value of the "informal learning" that takes place in the museum setting. "We'll be exploring how kids understand the evidence and relate it to theory and scientific explanations, and how parents guide children in that process," said Luce. Callanan, who has collaborated with Children's Discovery Museum for nearly a decade, is also helping designers plan the new exhibition. Scheduled to open in 2011, the exhibit will feature a life-sized model of the full mammoth, as well as some of the fossilized remains, which include much of the skull, the tusks, teeth, and parts of a femur, the hip, and pelvis. The mammoth has been dubbed "Lupe" for the spot along the Guadalupe River where its remains were discovered in 2005. "We are very excited to be able to continue our progressive research partnership with Maureen Callanan and her developmental psychology students through this new four-year project to create a major interactive exhibit based on the mammoth discovery," said Marilee Jennings, executive director of Children's Discovery Museum. "Our past work together has been instrumental in bridging gender and cultural issues in museum exhibit design, making what we design and build relevant and engaging to children of varying ages and backgrounds." Exhibit stations will give young visitors many opportunities to investigate. "The stations will focus on questions kids are likely to have, like 'What is it?' and 'How old was it?' and 'How big was it?' " said Callanan. How children and families pursue those questions is the grist for Callanan's mill. Lupe was about six-feet tall when it perished, compared to adults who could reach up to 13 feet. But some questions--like whether the mammoth was male or female and the cause of its death--remain unresolved, which gives the museum an opportunity to teach another important lesson about how scientific knowledge evolves over time, said Callanan. "Focusing on the evidence is good for critical thinking and it helps children learn to think logically," said Callanan. "One goal is to help kids feel comfortable as people who can think about things like a scientist." The fact that Lupe's remains were found in the vicinity of the museum is an added bonus, especially for young residents of downtown San Jose, said Callanan. "It will get them thinking about what the area was like back when this animal was walking around," she said. The remains were discovered by San Jose resident Roger Castillo while he was walking his dog along the Guadalupe River in 2005. "He was being a scientist," noted Callanan. "He saw something and wanted to understand it, so he began asking questions." Castillo contacted paleontologists at UC Berkeley, whose excavation uncovered a scientific puzzle: Lupe's remains were found in a layer of soil where they weren't "expected" to be, said Callanan. "Does that mean mammoths lived during a different time period? Or maybe the age of the soil was misidentified," posited Callanan. "It's a perfect illustration of the scientific process: Ultimately, this discovery might prompt a geological re-evaluation of what we know about the soil in the San Jose area. A lot of people think of science as being a matter of absolutes, when in reality it's always changing and responding to new evidence." And who knows? Perhaps that scientific conundrum will be resolved by a junior scientist who discovers his or her passion for exploration through an encounter with a mammoth named Lupe.